In his first fight on American soil since 2016, and this time as a 40-year-old, Manny Pacquiao defeated Adrien Broner by unanimous decision at the MGM Grand in Las Vegas to retain his WBA welterweight title. Dave Moretti scored it 117-111, Glenn Feldman saw it 116-112, and Tim Cheatham had it 116-112. Pacquiao was just simply too fast and too aggressive as he completely dominated the boastful Broner, who just threw much fewer punches than the champion. Right after the bout, Pacquiao said he is willing to rematch Floyd Mayweather, who was at the ringside, and met Pacquiao in his locker room just before the match. "Tell him to come back to the ring, and we will fight," Pacquiao said during the post-fight interview. "I'm willing to fight again to Floyd Mayweather if he's willing to come back in boxing." Mayweather, however, had no reaction to the challenge made by the champion senator. At the start of the fight, Pacquiao immediately fired his arsenal at Broner together with jabs and punches to the head and body. Pacquiao shot more than 70 jabs in the first three rounds, watching Broner's counter punches. "The Problem" had his best offensive in the fourth round, landing his best blows of the fight on his counter shots, but he just couldn't land consistently. Pacquiao spewed power in the middle rounds, connecting a solid left to Broner's body in the fifth round. In the seventh round, he roused the challenger with a barrage of blows, and pinned him against the ropes, but just couldn't deck the Cincinnati fighter. In the ninth round, Pacquiao again mangled Broner with a crushing left bomb on his face. "I beat him," Broner shouted amid boos from the audience. "Everybody out there know I beat him. I controlled the fight. He was missing. I hit him more times. I beat him." In reality, Pacquiao connected more than twice as many punches as Broner, 112-50. 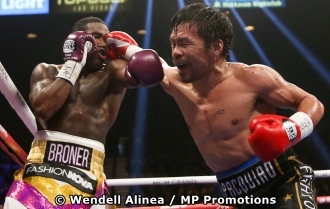 Pacquiao did not fight like a 40-year-old fighter and he outboxed the 29-year-old Broner. According to CompuBox, Pacquiao threw 568 punches as compared to 295 for Broner. ESPN's Dan Rafael tweeted: "We go the scorecards in Las Vegas: 117-111, 116-112, 116-112 all for the winner Manny Pacquiao! I had it a shutout. Most here at ringside had it anywhere from a shutout to 2 rounds for Broner." "with age comes wisdom and for Manny Pacquiao, comes heightened boxing IQ. At an advanced age he has made adjustments to his style and evolved"
Broner was guaranteed a purse of $2.5 million for the fight and Pacquiao could get not less than $10 million, although both fighters could earn more. This fight was Pacquiao’s first bout with Premier Boxing Champions of Al Haymon. After a very successful defense, he is slated to face any of the promotion's top welterweights. But Pacquiao prefers a second encounter with Mayweather for the bigger payday. "Thank you Lord for the victory! Thank you to my wife Jinkee, my family, friends and fans from all over the world. Thank you to everyone who watched my fight tonight. Thank you for all your support. I wouldn’t be where I am today without all of you. May God bless you all." According to Dan Rafael: "Broner should be ashamed of himself for jumping on the ring post as though he won the fight." I think he is just happy being able to evade a knockout from Pacquiao.